What started out to be a little bit like our past several games – a lethargic midfield, sloppy passing, and making opportunities for our opponents – turned into a return to the dominating form we all love and a pretty easy Sunday Afternoon Stroll. Maybe not quite a stroll in the park, but a comfortable win and a confidence builder amidst so much pressure in the final stretch of the season. Thanks, guys! Of course, if we are going to start poorly, someone has to give us a heart attack early on, and if Bonera’s on the pitch, you can usually guarantee it’s him. Save for a few giant games where aliens possessed his mediocre, prone-to-big mistakes body and he came up big for us when we really needed it, he’s still that mediocre, prone-to-to mistakes defender that is the worst at the center back position. In less than 3 minutes’ time,he had taken down Destro just inside the box. Another call that absolutely went our way, consider ourselves lucky. Of course, Siena got lucky just 3 minutes later when a handball on Larrando was not called, but if I remember correctly, it wasn’t in the box. Then Terzi got the worst of a foul on Boateng in the 15th, and got the yellow card for it, too. He eventually had to be subbed off in the 35th. Memo to Terzi: don’t mess with Boateng. We started looking a little more dangerous with a shot wide by Ibra in the 15th, then a shot by Boateng that hit the crossbar and was whistled for offside anyway. But despite our anemic midfield, Ibra crossed the ball in, Brkic tried to save it, but Cassano was there to poach the loose ball right out of his hands for the goal in the 27th. 1-0 Milan. What a great first start back for Fantantonio. Not 2 minutes later, Ibra also scored straight into the back of the net to make it 2-0 Milan. Our boys were not shocked into form, rather it was still a bit of awakening. For some reason, being 2-0 up in the first half was like a distant memory to them, and I’m not sure they remembered how to play that way. Except that then they did. Not before Bonera gave up a dangerous free kick with a foul on Destro in the 42nd, and a very dangerous chance building on that play was cleared by Yepes. It looked like he took a bit of a knock, hope he’s okay. And in the final minute of stoppage time at the half, the ref actually whistled a foul on Ibra. You’ve got to keep track of those, because those whistles come very few and far in between for the hulking Swede. Siena’s first real chance of the game came when Destro woke Abbiati up, but of course our main man between the sticks saved it comfortably. In the 50th, Gattuso earned his requisite yellow card. In the 60th, Aquilani came on for Muntari, a great sub by Allegri to get things happening in the midfield. Milan was dominating now, but Siena were capitalizing on their chances. Milan had 71% possession, but Siena still managed 7 shots, 4 on goal. More impressively, Milan took only 10 shots but a whopping 8 were on target. Talk about accuracy, we certainly kept Brkic honest. Well except for that “save” on Aquilani in the 70th where he actually made contact. But the luck evened out on this one, I think. In the 69th, Boateng earned himself an Ibra Lecture™, as he did not put the cross in with the pinpoint accuracy the big man demands. But Boateng seems like he can handle himself just fine. In the 72nd, Gattuso was living very dangerously with a foul that could have easily been a second yellow for him. Thank you, Christian Brighi, for being a merciful ref. He was also merciful when van Bommel went for a piggy back ride – maybe it was just his sense of humor. But van Bommel did get the yellow, and that means he’ll still miss Atalanta on Wednesday for card accumulation. In the 75th was when we really picked up steam, as Captain Gattuso was subbed off for the one and only Nocerino. In the 80th, El Shaarawy came on for Boateng. 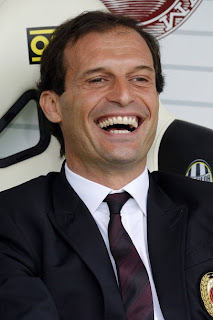 Something tells me that Allegri does in fact know how to sub if he’s actually got players available. Still, we couldn’t keep a clean sheet, as Bogdani slotted a goal in after a save on a Destro strike in the 83rd. 2-1 Milan. A shame. With more than 1 of our starting back line playing maybe that wouldn’t have happened. But Nocerino wasn’t going to sit around and let them grab another. With a series of twists and turns around the Siena defense, he singlehandedly grabbed the 3rd goal with like the hero that he is in the 90th minute. 3-1 Milan. Amazing. And in literally the very last play of the game, Ibra slotted another one home for his brace, both assisted by Cassano, of course. 4-1 Milan. That broke his record for goals in a single Serie A season, with 26 total. Ibracadabra, indeed. A fantastic way to say “We’re back!” and keep the pressure on Juve. Speaking of pressure, Allegri is under a lot of pressure with rumors of everyone from Guardiola to the Pope to my grandmother (may she rest in peace) being vetted for his position. But a few Milan fans made a statement to day with a banner that translated “We’ll be happy to see you again,” using Allegri as a play on words (Allegri = happy.) Good for them. He deserves a vote of confidence down the stretch, too. Allegri in every sense of the word. In my preview, I asked our boys “How much do you want it?” and “How much gas do you have left in the tank?” I think the score shows the unconditional answer to that. Even if we took a little time to find our way, and even if it seemed like we strolled through Siena on a slightly wet Sunday afternoon, our boys answered with 90 minutes that gave confidence to them, to the fans, and hopefully put a shiver down the spines of Juventus. (One, two, Milan’s coming for you… three, four, better shut the door…) We may have lost the chance to determine our own fate, but our boys are going to finish proud.